Product prices and availability are accurate as of 2019-04-21 10:19:31 UTC and are subject to change. Any price and availability information displayed on http://www.amazon.com/ at the time of purchase will apply to the purchase of this product. Our 1950's Decade Candy Gift is a hand-picked collection of sweet memories with the nostalgic candies you remember from your childhood. Once you receive this delicious decade gift it'll be hard to stop talking about it. This candy gift is a perfect and unique birthday gift or anniversary gift, and is a great alternative to gift baskets. Includes a complimentary "Back in the 1950's" insert with many snippets that are sure to bring smiles and evoke memories of years past. The 1950's candy gift includes: Bit O Honey, Black Licorice Pipe, Bonomo Turkish Taffy, Boyer Smoothie Peanut Butter Cups, C Howard's Scented Gum, Candy Stix Cigarettes, Charms Sweet Pop, Chase's Cherry Mash, Chick-O-Stick, Chocolate Cigarettes, Chuckles Jelly Candy, Coconut Long Boy, Gold Mine Bubble Gum, Hoffman's Cup-o-Gold Chocolate Candy Cups, Moon Pie, Necco Candy Buttons, Necco Mary Jane, Necco Skybar, Necco Slap Stix Caramel Pop, Necco Wafers, Pearson's Bun Bar Maple, Sen Sen, Snaps Licorice Candy, Sugar Daddy Jr., Teaberry Gum, Wack-O-Wax Lips Chewing Gum, Walnettos, Zagnut Bar. About Hometown Favorites: Since 1996, Hometown Favorites is the online destination for old fashioned candy and nostalgic candies and unique food gifts. We carry a large assortment of retro candy from the 1950's, 1960's, 1970's, 1980's, and 1990's. Thousands of our customers have enjoyed our hand-picked candy gift baskets filled with hard-to-find retro candies you can’t find anywhere else. It doesn’t matter if you are a Baby Boomer, or from Generation X, Y, or Z, our nostalgic gifts prove that some things really were better when you were a kid. 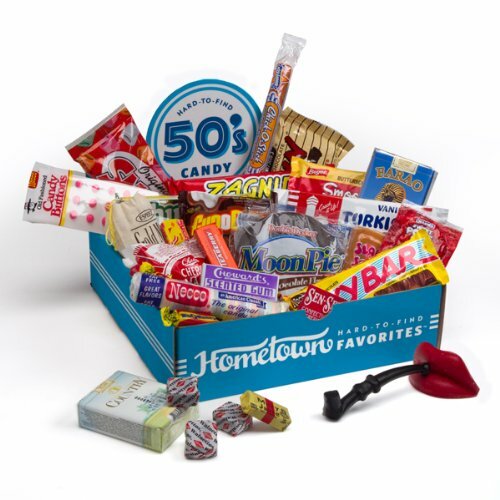 Relive the memories of your most nostalgic decade with the Retro 1950's Candy Gift Box from Hometown Favorites. This box contains a full decade of treats that have been hand-picked and carefully packaged into a unique gift, perfect for the holidays, birthdays, or anniversaries. The 1950's Box includes a complimentary "Back in the 1950's" insert with commemorative snippets evocative of years past. Hometown Favorites has been serving as the online destination for old fashioned candy, nostalgic candies, and unique food gifts since 1996. Hometown Favorites carries a large assortment of retro candy from the 1940's, 1950's, 1960's, 1970's, 1980's, and 1990's.